Your browser does not support inline frames or is currently configured not to display inline frames. At Juventus, in a team featuring numerous members of Italy's victorious World Cup squad, Platini had a difficult introduction to Italian football. He was a target in the demanding Italian sports media, and even came close to leaving Italy in the winter of his first season. Platini and team-mate Zbigniew Boniek successfully called for a change in tactics, and in the second half of the season Juventus saw an upturn in their fortunes. They reached the European Cup final, losing to Hamburg, and won the Italian Cup, the first of many club honours to follow for Platini in the coming seasons. He won the Italian championship with Juventus in 1984 and 1986, the European Cup Winners' Cup in 1984, the 1984 European Super Cup, the European Cup in 1985 (in a controversial game against Liverpool), and the 1985 World Club Championship. He finished top scorer in Serie A for three consecutive seasons (1982-83, 1983-84 and 1984-85), and won a hat-trick of European Footballer of the Year awards (1983 through 1985). 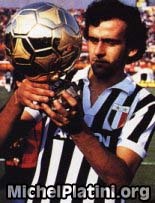 Platini was also voted Player of the Year by World Soccer magazine in 1984 and 1985. The 1985 European Cup final against Liverpool at the Heysel Stadium in Brussels should have been the crowning moment of Platini's Juventus career. The stadium was not fit to stage a match of such importance, and before the teams had kicked off, a wall collapsed under the weight of Juventus fans rushing to avoid a group of Liverpool fans who had made their way into section Z of the ground. 39 people died, and 600 more were injured. It was decided to proceed with the match in order to avoid inciting any further trouble, and after both captains had appealed for calm, the match began just under an hour and a half beyond schedule, with riot police still engaged in a pitched battle with Juventus fans enraged by the lack of organization that had led to the bloodshed in the stadium. (See Heysel Stadium disaster.) Platini scored the only goal of the match from a penalty kick awarded for a foul on Zbigniew Boniek. In the days following the final, Platini was criticised in some quarters for his lack of restraint in celebrating Juventus' win. In his own defence, Platini maintained that like every other player on the field, he had not been made fully aware of the scale of the disaster. Following the 1986 World Cup in Mexico, Platini spent another season at Juventus before retiring from football in June 1987.